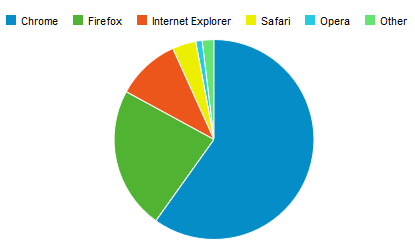 Browser Statistics What is the most popular browser? OS Platform Statistics What is the most common operating system? Screen and Color Statistics What is the most common screen resolution? Google Chrome was released in 2008, and is the most popular browser today. Mozilla Firefox was released in 2004, and is one of the most popular browsers today. Internet Explorer from Microsoft was released in 1995, and is still a popular browser. Apple Safari is the default browser for Mac systems. Safari is known for its sleek design. Opera is a fast standards-compliant browser, often used in small devices, tablets, and phones.